The route starts from the road junction in “Santa Maria de Matamala”, head north and go up the track that leads to “El Lladré” farm. Pass by the R177 sign Can Vinyal and walk to the left, towards Viladonja. Once at the farmhouse, where they make cheese and dairy products, you have to follow the old path to Viladonja which in a short but steep climb will take you to a flatter trail. You will arrive at a wide pass, “Devesa de Cal Sastre”, from where you can enjoy a beautiful view with the “Cal Sastre” farm down the plains, and just in front of you across the river, the “Reixac” farm and the “Collada del Forn”, another mountain pass. Continue uphill along a track that will take you up to the ancient path from Ripoll to Berga, to the Camp de Pinyons pass, R172 sign. At this point go right, leaving behind other paths and trails that start from your left, and walk through the fields above the “Camps” farm. The path crosses a stream and continues on a gentle descent towards the “Collada del Forn” pass. Leave on your right the track leading to the “Reixac” house. The Collada del Forn pass, R173 sign, was a busy crossroads between the old road from Ripoll to Berga and the livestock path from the Lluçanès area to the high Pyrenees. From here it is worth a visit to the “Forn” farm, one of the oldest in the region and built with defensive walls. 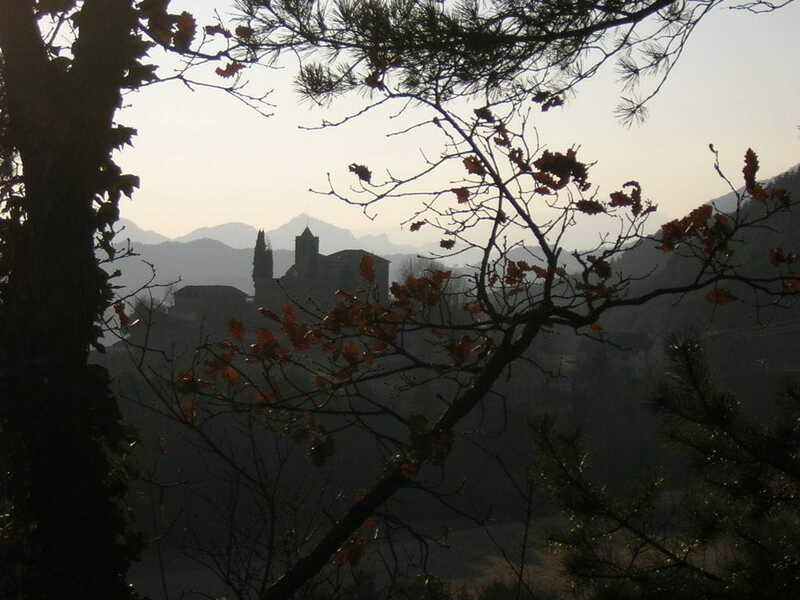 To get there, you must walk towards “Sant Esteve de Vallespirans”, and the house is less than 10 minutes away. Continue in the direction of “Santa Maria de Les Llosses”, now following the livestock path heading south. Keep walking on this path and you will cross a stream to get to the “Roques Blanques” spring. Further away you will arrive at the “Capdevila” farmhouse. You are now in “Santa Maria de Les Llosses”, and old parish, that together with Palmerola, Viladonja, Vallespirans, Vinyoles, Sovelles andMatamala constitute the current municipality of Les Llosses. Leave the livestock path behind, cross the road, and head towards the Capdevila flatlands, R178 sign, continuing towards “Santa Maria de Matamala”. At the end of the plain leave the track behind, and take a little trail on your right that will lead you to a stream and to the ancient mill of “Les Planes”. Cross the “Corbera” stream and after a last effort you will getto “Santa Maria de Matamala”, the starting and finishing point of this circular route.